On his return from the airport, Harvard University Prof. Henry Louis Gates Jr., attempted to enter his front door, but the door was damaged. Prof. Gates then entered his rear door with his key and again attempted to open the front door. With the help of his driver they were able to force the front door open. Both Gates and his driver are African-American. According to the Cambridge (Mass.) Police report, a white woman saw the two black men attempting to enter the home and called police. When the officers arrived, Gates was already inside. The police officer asked Professor Gates -- the Director of Harvard's W.E.B. Du Bois Institute for African and African American Research -- whether he could prove that he lived there and taught at Harvard. According to Police officer James Crowley, Gates responded to his request for identification: "Why? Because I'm a black man in America?" Professor Gates later handed both his Harvard University identification and his valid Massachusetts driver's license to the officer. Both include his photograph and the license includes his address." Despite his positive identification, Gates was then arrested for disorderly conduct . President Obama, who is a friend of Prof. Gates, initially said the Cambridge officers “acted stupidly” in arresting him but later the President backpedaled, implying that the word "stupidly" was subject to varying interpretations. This July 16, 2009, episode symbolizes the endemic problem of racial profiling in our nation. A meeting initiated by the Black Alliance for Just Immigration (BAJI) and Priority Africa Network was held on July 23 to discuss such issues. 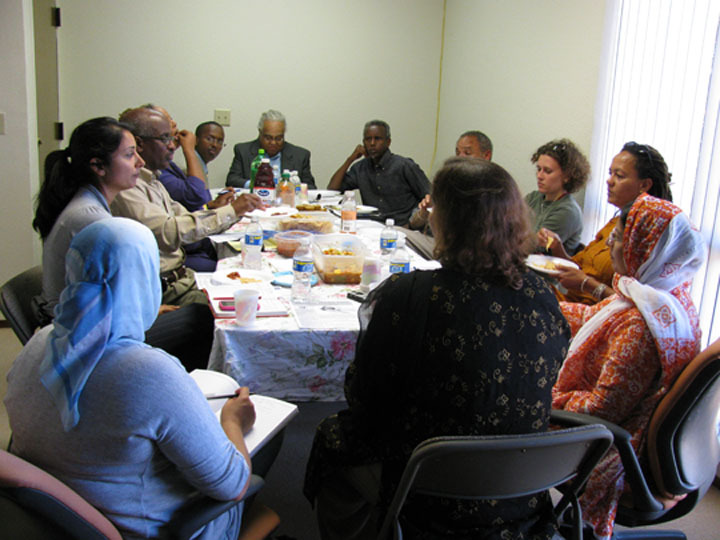 About a dozen people representing various Bay Area organizations attended the meeting held at the premises of the American Muslim Voice in Newark, CA. BAJI is a group of African Americans and black immigrants who are working towards uniting communities for just and fair immigration reform. Priority Africa Network works in mobilizing African immigrant community groups in the greater Bay Area. 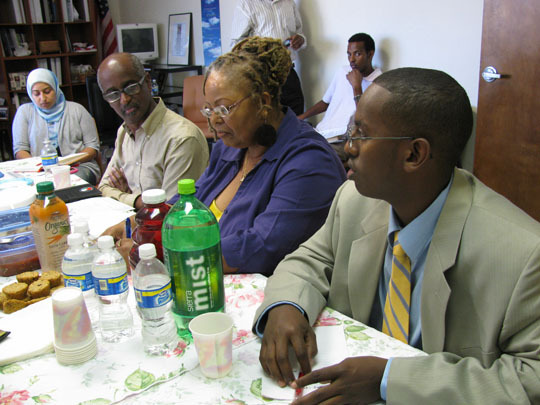 BAJI leadership believes that African Americans, with their history of being economically exploited, marginalized and discriminated against, have much in common with people of color who migrate to the United States. The Objective of such gathering is to bring together activists, scholars and legal experts to a discussion current and historic policies of racial profiling as practiced against all our communities by the police, the FBI and Customs & Border Protection of Homeland Security. The meeting was also attended by Veena Dubal, Staff Attorney and Summer Hararah, Program Coordinator of the Asian law Caucus which is dedicated to promote and represent the legal and civil rights of Asian and Pacific Islander (API) communities. Attorney Veena Dubal told the gathering that her organization would be happy to extend legal support to victims of racial profiling or police harassment. Veena reminded that the FBI has powers to have surveillance of people without their knowledge. She suggested that all organizations should sponsor a film to expose racial profiling. Ahmed Dirie, a visiting Somali scholar at UC Berkeley, briefed the meeting about the recent profiling of Somali communities particularly the FBI probing into their activities in Minnesota. He said that civil rights group did not come to their help. “Black civil rights group also did not help. Then I took the risk to take up the issue of Somalis.” He said he took the risk although he is not an American citizen. About the situation in his homeland, Dirie said that there is no government in Somalia for the last two decades. Illegal fishing is going on in Somali waters. Toxic waste is unloaded off Somalia. In a recent article in San Francisco Chronicle Ahmed Dirie captured the plight of his nation in these words: With every imaginable human rights and environmental abuses taking place in Somalia every day, the country has been forsaken not only by the international community but also by Muslim advocacy groups in the United States, and indeed the entire Islamic world. Thegthering was also briefed about the racial profiling experience by communities of African descent through CONTELPRO and the current injustices based on race. What is CONTELPRO? It is the acronym for a series of FBI counterintelligence programs designed to neutralize political dissidents in the 1960s and 1970s. The program was directed against the civil rights movements, especially against the community leadership of African Americans, Latinos and Native Americans. In the 1980s similar program was used against Central American solidarity groups. According to attorney Brian Glick, the author of War at Home, four methods were employed by the FBI at the height of the CONTELPRO operation during 1960s and the same methods are being employed now which include: (1) Infiltration in the community. (2) Psychological warfare from outside. (3) Harassment through the legal system. 4) Extra legal force and violence. We see all the four methods being applied against the Muslim community. 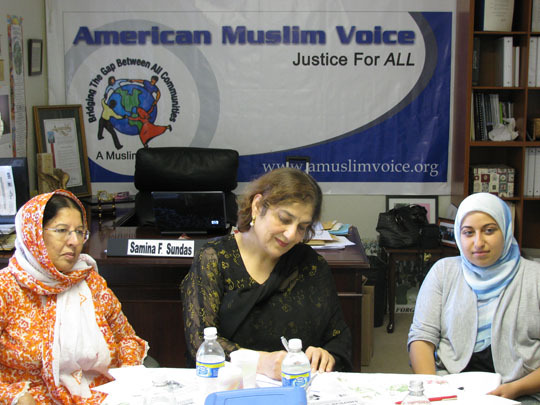 Samina F. Sundas, the Founding Executive Director of the American Muslim Voice (AMV), pointed out that in the past almost all the ethnic and religious communities have experienced discrimination and profiling in the US and the Muslims are the latest targeted group. “Our goal is to break barriers and form alliances among groups to meet the challenges posed by the current discrimination, profiling and civil rights violation of diverse ethnic as well as religious groups,” Samina concluded. The meeting ended with a prayer by Rev. 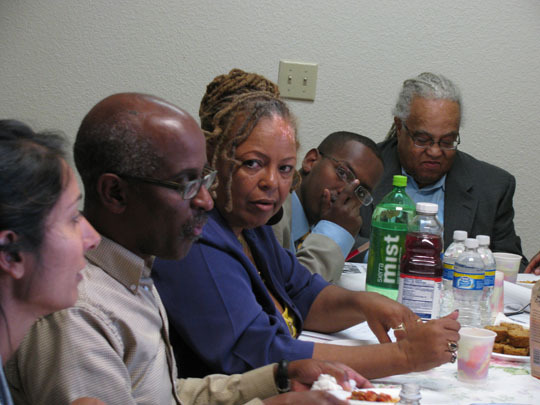 Phillip Lawson, the Interfaith Program Director for East Bay Housing Organizations (EBHO). However, Dr. Wilmer Leon, the host of the nationally broadcast call-in talk radio program "On With Leon" and a Teaching Associate in the Department of Political Science at Howard University in Washington, DC., believes that as a Harvard University professor Gates failed “Black Man – 101” don’t argue with the police unless you want a beating and to go to jail! Has he not seen the arrest data? Has he not seen the incarceration data? Has he failed to learn the lessons from his elders that I have learned from mine? My parents and other elders have always taught me, “an argument with a cop is an argument you will always loose…if you don’t get along with the police; you will probably go along with the police and that’s a trip you do not want to take. Even when you’re right, if you fail to comply you’re wrong.